Early Spring invites a wave of new crops to the Farmers’ Markets. Roots, peas, greens and strawberries will slowly begin to make their way into the city and onto our plates, supporting our bodies’ natural detoxification processes. It is common to feel sluggish and a little bit stagnant at the end of the cold winter months. Just like plants and animals, we also go through natural cycles that reflect seasonal variations in weather patterns and sunlight. At the beginning of spring, you may find that your body is naturally craving lighter and fresher fare, rather than the rich stews and heavier meals that supported you through winter. When the cravings for wholesome foods begin, do not hesitate to listen- you will not only support your body’s physical health but your mental health as well. 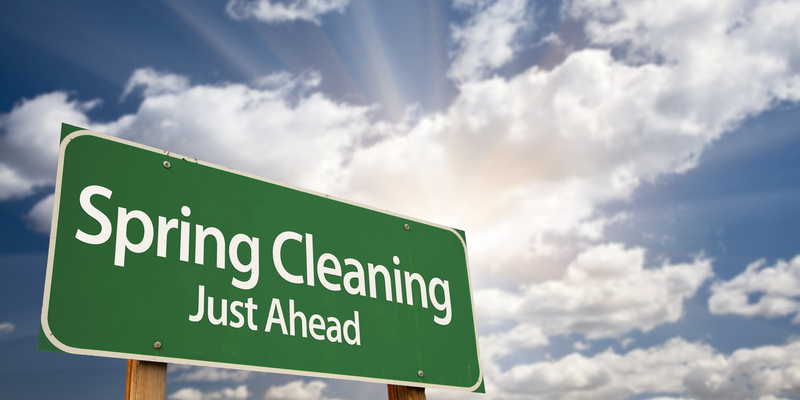 Discover these top four easy breezy tricks for spring cleaning- inside and out! Have you heard of the saying that structure implies behavior? The way we set up our kitchen and the food we keep in our pantries and refrigerators determines what and how we will eat. 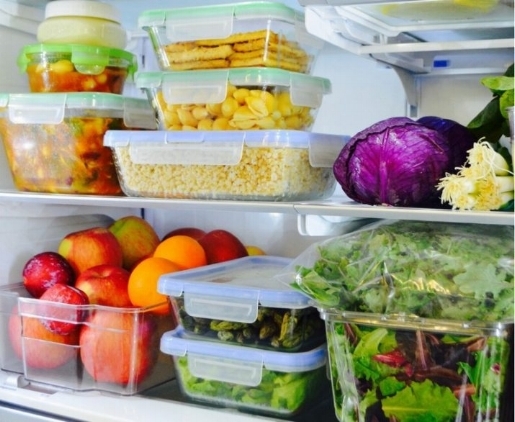 Take some time to go through your food stash and replace processed, sugar-loaded items with fresh, healthier alternatives. Consider this simple trick: When you go to the grocery store, begin your shop on the outer periphery of the store, starting with the produce section. You will avoid the colorful temptations of the packaged goods in the center isles. Another way to create heathy behavior is to create a delicious (and doable) meal plan. Take a moment to consider the foods and meals that help your body to thrive. Brainstorm a list of your favorite breakfasts, lunches, dinners and snacks. For inspiration, peruse healthy food blogs and your favorite cookbooks. Consider the influx of spring produce and try to incorporate as much seasonal, fresh (and maybe even local) food as possible. Tip: Keep your meals simple and fresh to start. Make it easy to follow your meal plan. If you are successful with your first week of meal planning, you are more likely to continue with your healthy habits. Sugar has made its way into every meal, not to mention drinks and snacks. As a nation, we have such a powerful sweet tooth that companies now add sugar (or corn syrup) to salad dressings, sushi, condiments, soups, sauces, smoothies, yogurts, crackers, breads, and so much more. Our food industry understands the addictive powers of sugar, and they use it so we will crave more and buy more. Read labels, avoid processed foods and cook at home as much as possible, so sugar doesn’t sneak its way onto your plate unconsciously. So why does this matter? Eating processed foods and sugar spikes our blood sugar levels to unhealthy levels, causing our bodies to quickly respond by releasing the hormone insulin. After spiking in an energetic high, a blood sugar crash with quickly follow. When we repeat this cycle, we can develop insulin resistance and eventually, type-2 diabetes. Beyond wreaking havoc on our hormonal systems and metabolism, our bodies store excess sugar as fat, leading to unwanted and unnecessary weight gain. Tip: Cut out sugary beverages and you are half-way there. Consider saving your sugar quota for a delicious and satisfying dessert that you share with your loved ones. And enjoy your sweets with some healthy fat, which helps to slow blood sugar spikes. How much green can you fit into your day? Green smoothies, green salads, sautéed greens, stir fries, soups, and even green (kale) chips not only taste delicious when prepared with care, but they support every system within your body, providing essential vitamins, minerals, antioxidants and fiber. 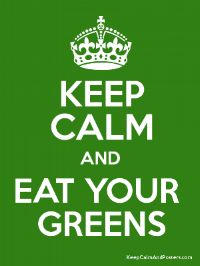 We understand that it is so easy to go through your life and skip the greens. When life gets busy, home cooking is stressful and preparing greens can feel like too much work. After all, lettuce and spinach are not designed to fill you up, and this makes them easy to skip. Tip: Add greens to your meal plan and shopping list, and prepare ahead of time to ensure you treat your body and mind with an abundance of plant-based foods that help you to thrive. As we shift into the spring season the light is coming back into our days and into our energy. We are moving from the darkness of winter, the bundled up, warm, comfort of cold weather into a bright period of transition. As the season literally shifts, it presents an opportunity for us to shift as well. In order to take full advantage of the changing season, our routine and diet needs to be adjusted to maintain balance. Ayurveda, yoga’s sister-science of self-healing, offers an understanding of the rhythms of the day, of the year, and of life. It also gives you another perspective on your own constitution, your tendencies, reaction patterns, physique, digestion patterns, and potential vulnerabilities for imbalance and disease. Having an understanding of this system, provides the opportunity to live more in harmony with the world around you and to take advantage of the natural energy that is present. Spring time is a perfect place to begin this. In Ayurveda, there are three doshas related to the elements: Vata (air & ether), Pitta (fire & water), Kapha (earth & water). Pitta is associated with the summer season when the sun’s rays hit the earth with the most intensity and heat. Vata is associated with the fall/winter season where everything is in flux and constant change. Kapha is the dosha of spring where everything is a constant mix of earth and water (mud and rain), and where the earth is warming up, blooming, and growing in abundance. For more details on the three doshas, check out Intro to Ayurveda. In order to take advantage of this Kapha season for the most amount of revitalization and growth there are certain things you can bring into your life through the lens of Ayurveda. Notice if your appetite has changed naturally and be mindful of not overeating at meals. Decline the heavy comfort foods of winter for fruits and vegetables. Fruits and vegetables don’t have to be raw, in fact lightly cooked, warm foods are better for digestion. Spring is a great time to create a new routine. It is easier to establish when the days are lighter and longer. Start by rising earlier, definitely before the sun. Don’t let caffeine be the first thing that hits your stomach in the morning. Instead drink a cup of warm lemon water to aid in elimination. Bring movement into your morning routine, even just 5-10 Sun Salutations when you wake up is great for circulation of your fluids and balance for your Nervous System. If you suffer from seasonal allergies, using a Neti Pot (with distilled water) 1-3 times a day is a wonderful way to keep your sinus passages clear. Spring is also the time to embrace light-heartedness and adventure. Reach out to friends to reignite your relationships and to reconnect. There is a reason we feel the need to clean everything and get rid of things as the season shifts. Winter brings a heaviness with it, as does the holiday season. Spring offers an opportunity to lighten our homes and our hearts through organizing, deep cleaning, and getting rid of the physical things we don't need anymore. 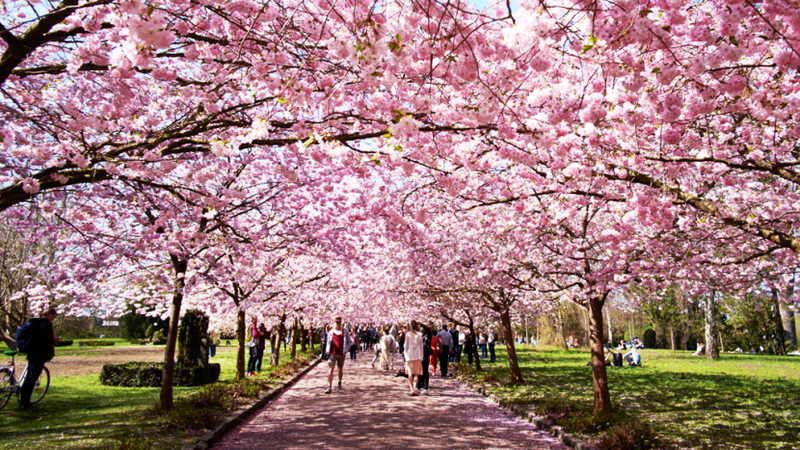 Spring is a wonderful time of year. Take advantage of all that this beautiful transition has to offer. You will shed the heaviness of winter and create a deeper harmony in your own life by simply living in tune with the natural rhythm of the season. Although many people are drawn to yoga to stretch and strengthen their bodies, practitioners quickly discover the benefits run deeper and wider, calming the mind and creating a deep sense of peace in the spirit. As a result of dedicated practice, yogis begin to experience the meditation and bliss of deep relaxation during restorative postures and Savasana. People may discover that they are working with the asanas (postures) to move into a deeper state of meditation. Over time, yogis will often set aside time to meditate after a physical practice to experience the deep release that comes from sitting or lying in stillness. The lesser known practice of Yoga Nidra often skips the physical postures and begins in a Savasana. Beginning with a body scan, the instructor invites a state of relaxed awareness, guiding the person or group deep into their bodies. Throughout the practice, yogis will experience a liminal meditative state between sleep and wakefulness. Yoga Nidra takes the concept of deep relaxation and merges the practice with meditation. Also known as dynamic or psychic sleep, Yoga Nidra is a method that takes practitioners through the eightfold path leading to Samadhi (Bliss). Although it appears like the practitioner is not doing anything at all, Yoga Nidra is often considered to be a more advanced practice than intensely physical yoga methods, requiring a deep sense of focus and willingness to be with one’s self. Like the physical, asana practice we are all enjoy so much, the benefits of Yoga Nidra run deep. Discover the top three benefits and power of this ancient practice. During Yoga Nidra sessions, people begin to access their subconscious mind and memories. It is often these repressed memories and experiences that create blockages in our bodies and in our lives. As people enter the state of relaxed awareness, their brain becomes more open and flexible. With the guidance of an experienced instructor, past traumas can be digested, moved-through and transformed. Research shows that people with imbalanced and addictive tendencies have low activity in the area of the brain that regulates interceptive awareness― our ability to recognize and understand sensations in our bodies. Yoga Nidra heals and regulates this part of the brain. With elevated levels of sensory awareness, you will find yourself more connected to the signals coming from your body, including appetite, emotional cues, and pain or pleasure. With the support of Yoga Nidra, you can change unwanted behaviors and reclaim your life. The restorative benefits of Yoga Nidra are mind-blowing― it has been said that one hour of Yoga Nidra is the equivalent of four hours of deep sleep. As you know, deep sleep allows the body to heal and regenerate. During Yoga Nidra, the body maximizes it’s ability to take in nutrients, regulate hormones and glucose levels, and boost immunity. By stimulating the parasympathetic nervous system (the “rest & digest system”), the mind quiets and your body begins to heal itself, naturally. Daffodils, tulips, and hyacinth are popping up in backyards, street beds and random corners of neighborhoods. With their sparks of color, these flowering bulbs are a reminder that spring is upon us—and so is pollen! From the lens of Ayurveda, the body’s response to the seasonal shift can be indicative of the diet and lifestyle choices made in the prior season. What we did or did not do, ate or did not eat, or drank or did not drink in the winter can play a role in how the immune system will respond in the spring. Ayurveda refers to spring as kapha season. Kapha translates to “stick together”. Giving us insight into the qualities of this dosha—cold, sticky, heavy, slow and wet. After a dry winter season, kapha qualities bring balance to the environment. An increase in rainfall adds moisture to the air and soil. While more sun hours transforms snow into water and warms-up the earth. Inspiring hibernating bulbs to bloom. As the season shifts from winter to spring, the body, mind, and emotions begin responding to the new season. If there is an over accumulation of kapha qualities in the body—cold, sticky, heavy, slow or wet, during the winter season, it can lead to kapha imbalances in the spring. Such as water retention, congestion, dry sinuses, weak digestion, heaviness and/ or a feeling of lethargy—imbalances that create stagnation in the body and mind. Spring imbalances in the body can often stem from improper digestion and dietary choices during the winter season. If a dish was not prepared appropriately or balancing for an individual’s constitution it can be challenging for the body to digest. Leading to ama or toxins, which can create stagnation in the body. In the winter, one key ingredient is omega-rich fats. Adding healthy oils to the diet can aid in counterbalancing winter’s dry qualities. Incorporating good fat into each meal also helps balance drying or mucous promoting foods. Such as dairy, grains or raw greens, which can further promote dryness, cold, and stagnation in the body, if not prepared for the season. Consuming sufficient healthy omega-rich oils in the winter is also helpful in protecting the intestinal walls, sinuses, and lungs. Providing a lubricating shield from spring’s pollen. In doing so, it can help prevent digestive issues, excess mucous production, colds, congestion—allergic responses during the seasonal shift from winter to spring. Combined with movement, a seasonal winter diet based on one’s constitution fosters in-season balance while preparing the body for the next season, spring. One of the key principles of Ayurveda is aligning our diets, activities, and routines to the season. Harnessing the circadian rhythm and letting Mother Nature guide our seasonal choices. Living with the season’s clock helps to optimize our energy for a better quality of life. While prepping our body with antidotes, like seasonal foods and activities, to stay healthy in the current season and the season to come. Here are some tips on how to foster stronger immunity in the spring and prep the body for the summer. Minimize or avoid refined, processed, excessive salty and sweet foods. Including dairy (especially cold dairy), wheat, grains, nuts, and seeds. Especially if you tend to have kapha imbalances, these foods may be too heavy to digest. These foods fall under the astringent taste, they help “soak up” water and reduce kapha qualities from the body. To prevent bloating, eat your pulses, lentils and beans warm. Fill half your plate at each meal with vegetables, including breakfast. Generally, greens and spring vegetables tend to be bitter and have a natural detoxifying effect on the body. Helping create lightness to help boost energy. Drink at least 6-8 glasses of water a day at room temperature to help flush the lymphatic system and nourish the tissues. Snacking throughout the day confuses the digestive process and leads to undigested food. Creating ama or toxins in the system. If you are hungry in-between meals, opt for fresh fruit. Fruit takes about an hour to digest, which makes it a perfect snack food. We like vitamin-c grapefruit in the spring. Dress it up a little and try it spiced. Bonus Tip: Consider a seasonal cleanse. A cleanse is especially helpful if seasonal imbalances are a reoccurrence issue. A guided cleanse can help de-stagnate the lymphatic system and re-ignite the digestive fire. Helping to boost digestion and the assimilation of nutrients. In the long-term, helping to foster a stronger immune system. Ayurveda teaches us that everything starts in the subtle realm before becoming gross matter. For example, many diseases can be traced back to certain thoughts, ideas or memories. Subtle energy (or your mood) is cooked into your food and actually changes the physiological components of the matter being cooked. That then affects your physiology --- as well as the more subtle components of your mind. Ayurveda, as well as the deeper teachings of yoga, teach us that we will take on the mood, the desires and the tendencies of the person who has cooked your food. Wow. It goes so far as to say ONLY eat food cooked from people whom you trust completely, or people you want to be like! Do your best. At least say a prayer before eating, which also changes the subtle components of the food in front of you. I like to think of brown rice as an intestinal broom, sweeping out the intestines as it digests. These sweeping qualities are due to the outer husk remaining intact, which contains fiber. The outer husk is removed from white rice, so it loses the sweeping benefits, and won’t give you that nice ‘full’ feeling. Grated ginger – I like it strong so I add a good teaspoon, but reduce if you need too. Add all ingredients into pot and bring to boil. Reduce heat and simmer 5–10 minutes, depending on how strong you like the flavor. Remove cardamom pods and cloves before severing. Bless and enjoy! 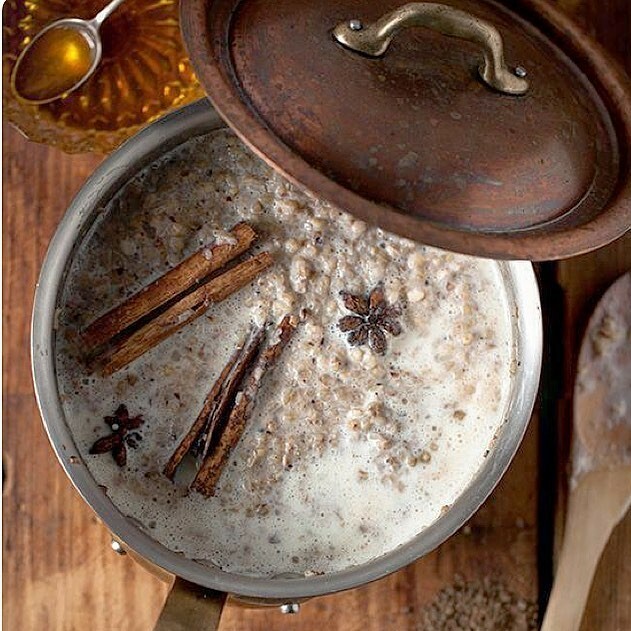 Oatmeal is one of my favorite breakfast foods for fall and winter. It is also great for a post-workout meal, and it will support and sustain your energy throughout the day. You can modify the ingredients and herbs in this recipe to your palette or match it to your Doshic (Vata, Pitta, or Kapha) digestive needs. Mix this all together and then mix well into oatmeal. Other nutrient-dense toppings: walnuts, brazil nuts, goji berries, cacao, ground flaxseed - be creative! A handful of mixed berries and it is ready!! Before eating always remember to say a prayer or pause with three breaths of gratitude. 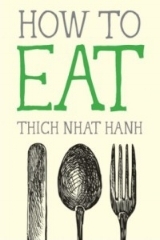 This practice connects you with the sacredness of food and the ritual of eating. It also tells your digestion to awaken and kick-on. Thoughts and prayers have vibration and energy. Food is made up of water and absorbs the frequency of these intentions. The food we eat becomes the cells in our body. Our body acknowledges that which is Sacred as healing and the food becomes our medicine! Winter is indisputably here. Here at Ananda Yoga & Fitness, we hold the intention to move through life in sync with the seasons. Listening to the messages and even advice each has to share with us and going with the flow or counterbalancing where beneficial. In North Dakota winter is first and foremost cold. It can be quite drying. Or it can be wet and snowy. It is a season marked by sickness — colds, flus, sore throats and so on. It is a season where nothing grows… the harvest fields of summer and fall now lie fallow. There is scarcity in nature’s offering. Except, perhaps, in the case of snow! According to Ayurveda, Winter is the Kapha season. A time marked by slowing down, turning in, and some stillness, even with the risk of stagnation. Picture a big, soft, slow-lumbering bear… nourishing himself generously and then retiring to his cave to hibernate the winter away. This bear is in sync with the season! Given the longer, darker nights, what more natural activity than curling up at home with a good book or your journal, reflecting on the year past and the year to come? This is also an ideal time for Yin or Restorative yoga, which encourages stillness and relaxed awareness. Relaxation practices help recalibrate the nervous systems and prepare us to meet the energy of growth and change that comes with Spring. However, while we might be content to sleep the season away, we can and should maintain active movement. The bone-chilling temperatures certainly might make a run outdoors less appealing, but with a host of indoor exercise options available, we can get the blood pumping, warm ourselves up and stave off stagnation and lethargy. Obviously a flowing yoga practice is ideal, whether gentle or powerful. Utilizing a gym membership gives you access to treadmills, bikes, rowing machines and maybe even a lap pool! And when in a pinch – choose 4 of your favorite upbeat songs and have a private cardio-dance party in your living room. This last option not only works the body but works on dismantling unhealthy ego as well! As we consider nutrition through the lens of the season, it might seem common sense that the winter is not an ideal time for cleansing, for example! It’s not that we can’t eat clean, but juices and smoothies just add cold to an already cold environment. Instead, it is a time for warming up and fortifying with hearty soups and stews. It’s also important to keep our digestive fires burning bright, helping to stave off stagnation, which can come from many things including too much stillness or too much heavy food. So by including warming and carminative herbs and spices in our diet (ginger, cumin, cardamom, coriander, orange peel, and many of the culinary herbs like rosemary and basil) we support healthy, active digestion. Add these to any one-pot recipe, savor a cup of flavorful hot chai, or start your day off with some warm ginger water. Deepening our breathing practices at this time are especially beneficial — bringing some intentional and powerful pranayama into our daily routines to deepen the breath, strengthen the lungs, expand their capacity and resilience. Diffusing essential oils throughout the home is another way to support respiratory health, as they are anti-microbial and cleansing to the home or office environment. I like using Anjali Aromatics’ Breathe Essential Blend which is a distillation of some of the worlds great coniferous trees. 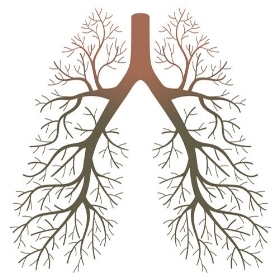 We might aptly consider these trees the “lungs of the planet” and so it’s fitting that their essential oils are some our lungs’ greatest allies. This recipe is an adaptation from a tri doshic chai recipe, that is, a recipe that is designed for all seasons and all constitutions. I’ve added a few extra warming spices including cinnamon and ajwain seeds and reduced the fennel to make it more specific for bringing warmth into the body through the winter. This recipe will help to keep any excess cool and damp qualities of kapha at bay. An excessive influence of kapha can manifest as mucous congestion in the chest or a heaviness in the stomach, mind and body. Regardless of being caffeine free, I find I still have plenty of focus and energy after sipping on this delicious brew! You can have this in the morning or take a thermos with you to sip throughout the day. I recommend using organic spices where possible for the most nutritional value and medicinal benefit. 1. Add water and ginger to saucepan and place on heat. 7. Stain ingredients and serve hot. ** if you’d like to add honey as a sweetener, wait until the chai has cooled in order to keep the medicinal qualities. If honey is heated at high temperatures, according to Ayurveda it can lose it’s healing qualities and becomes poisonous if consumed. In Ayurveda, how you eat your food is just as important as what you eat. Ayurveda understands that eating is one of the most sacred experiences we have. After all, when we eat our food, we are taking in the atoms and molecules that have been around in different forms since the beginning of time and asking them to become a part of us. If we eat our food properly, with awareness and respect, the food joins well with our bodies. If we do not, the food has difficulty joining with our bodies and causes gas and other digestive disturbances. The end result of poor digestion is ama (toxins formed from undigested food), and this can lead to disease. Therefore, in Ayurveda, we try our best to make eating a form of meditation and a daily sadhana (taking ordinary activity and approaching it with spiritual awareness). To prepare the body to receive food, begin meals with a prayer or by taking 3-5 slow breaths with eyes closed. Eat in a calm environment where there is little distraction. It is best to avoid the television, computer, reading, and phones. Minimize excessive conversation and all conversation about emotionally intense issues. Chew your food until it is an even consistency. This automatically directs awareness to the food in your mouth and supports improved digestion and absorption of food. It enhances the overall ability to extract more nutrients from the food. Eat at a moderate pace and until you are 75% full. Overeating is one of the significant causes of disease in our society. When we overeat, digestion becomes difficult. Following your meal let your food digest some before going on to the next activity. It is best to wait 15-20 minutes for food to digest. During this time engage in light conversation or read a light book. You can also go for a slow walk. If you are rushed, take at least 3-5 slow breaths to transition and mark a close to the sacred experience of eating. It is best to drink only a limited amount of liquid with meals. One-half cup of room-temperature water is average. Dry meals may require more. Moist meals, like soup, require none at all. Take all water and drinks at room temperature or warm. Cold drinks and ice destroy the digestive fire (Agni) and decrease digestion. This is true not only at mealtime but also throughout the day. The body's rhythms mirror those of the universe and digestion is strongest around noon when the sun is at its peak. Therefore, it is best to eat a larger meal around noon and have a lighter meal in the morning and the evening. Allow three hours between meals for food to digest. This allows most people 3-5 meals per day. Those with a Vata nature or imbalance should eat 4-5 times per day. Eat food prepared with love. The energy of the chef is always in the food. Avoid eating food prepared with anger or resentment. We eat not only the food but also the emotions of the chef. It’s easy to forget that bones are living tissue, constantly being dissolved and rebuilt in a natural cycle. So, while statistics around bone health are quite staggering, the good news is that we can have an impact on maintenance and repair at any age. Our bones are comprised of both minerals (like the obvious calcium) and a “gelatin matrix” of water and collagen. They appear solid, but, like bamboo, are healthiest when they are strong and but flexible, pliant and moist. Surprise surprise: Yoga is one of the most effective practices for bone health. There have been many studies published over the last few years that show yoga can not only slow bone density loss, but can in-fact increase bone mineral density. In short, the three yogic practices below can help maintain bone health starting from a young age, slow or prevent density loss, and even boost bone density, restoring strength and elasticity. Research has recently shown that 72-seconds is an ideal time to hold a yoga posture for maximum benefit. But no worries if this is too long, yoga is a practice so work at your capabilities and gradually over time you might find your endurance increasing. As you practice these asanas, listen to your body’s signals and work to your edge but not past it. Uncomfortable strain on joints should signal you to back off. Weight-bearing yoga postures put the right kind of “stress” on the bones: enough to stimulate cellular production, but not too much that the bones break or fracture. Resisting gravity’s pull and supporting our body weight stimulates our bones isometrically, signaling the bones to build up their mass in answer to the challenge. These powerful standing postures activate the largest bones of the legs and arms, plus the ankle, knee and shoulder joints. Bhujangasana is an active back bend that supports spine health, lengthening vertebrae and keeping them supple and limber. Resisting gravity in this shape strengthens wrists and builds core strength to support the spine. The WHO estimates one in three women over 50 — and one in five men — will suffer from an osteoporotic fracture. Many bone injuries are caused by falling, and we’re not just talking about a serious fall. Even a little roll of the ankle off the curb (or from teetering on a pair of stillettos) can cause a fracture. Maintaining our balance as we age is a huge piece of preventing injury. Tree pose is one of the simplest standing balancing postures to practice, yet has a powerful effect on developing balance and equilibrium. Best of all, it offers many different modifications suitable for all ages and levels. There has been so much research done about various exercises that support bone health, and one that remains ahead of the pack is high-impact movements. The New York Times goes so far as to suggest simply jumping up and down! This simple Eastern exercise delivers many of the same benefits of jumping or running, and many more. Best of all, it decreases the intensity of contact, making it safer for those with fragile knees or limited capacity for cardio-vascular workouts. Check out the video below that explains and demonstrates this easy movement. This is also a fun practice to do with your children! *If you suffer from severe symptoms of Osteoperosis, check out this great yoga sequence created just for you – with modifications for all levels. * When beginning any new type of exercise, always consult your primary care doctor, especially if dealing with acute physical problems. 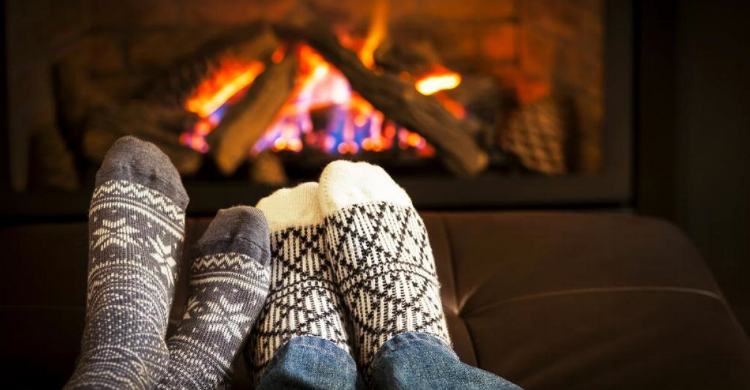 The frosty chill in the air marks a transition from Fall to Winter, as well as the holiday season, which can be a time for slowing down and enjoying the company of loved ones. Perhaps more than any other time of year, the holidays are a time to celebrate giving as well as receiving. They are a time of cherished exchange. For many of us, however, holidays can bring up mixed emotions. More often than not, we find ourselves overstretched providing for others, accommodating the crowd, and filled to the brim with rich holiday food, not to mention the challenges many people face reuniting with relatives absent from our lives until this special time of year. We tend to hold this tension in our bodies. A regular yoga practice can provide tremendous relief amongst the cheer and chaos of the holiday season. Remembering the core values of holiday spirit and slowing down enough to enjoy the experience is easier said than done. The following short sequence can support digestive and emotional balance in the upcoming weeks, helping you to ride the waves of the season. ~ Begin with a short warm-up. You can practice 3-5 sun salutations, take a brisk walk or jog, and/or practice 3 rounds of kapalabhati breathing to prepare the body for the postures. ~ When you feel warm, move into the following sequence, holding each posture for five deep breaths, or until your body tells you to move onto the next side or into the next posture. Be gentle with yourself. Each of these asanas will give your body and mind a different gift that we are certain you deserve this season! And for those who think they don’t have time, here’s a gentle but firm reminder to chuck out any excuses, slow down and practice some self care. Nestled under the rib cage at the base of the lungs, the diaphragm is the body’s best breathing muscle. Here’s how it works: When we breathe in, our diaphragm flattens out and moves down, creating a vacuum for air to rush into; when we breath out, our diaphragm relaxes and moves up, pushing air up and out of our lungs. While our diaphragm is always working, we often don’t use it as much or as well as we could. Think of bending over to pick up a heavy box and straining your lower back instead of squatting down and lifting from your legs. That’s what shallow breathing is like — using your chest and neck to pump air in and out when there’s a much stronger muscle (the diaphragm) made for the job that’s waiting for some action. Yoga is an incredible practice for engaging with the breath; we are constantly reminded to return to it, witness it, and listen to it. But off the mat it can be easier to let the thread of breath slip away. Practicing diaphragmatic breathing is a super simple way to breathe more deeply wherever we are, immediately increasing the amount of oxygen in our system and blood in our brains. First, try it lying down. Place one hand on your chest and the other on your abdomen. Take a deep breath in, following the movement of the diaphragm as it fills with air. If you’re breathing into your diaphragm your top hand will stay where it is while your bottom hand will rise as the belly fills. On the exhale, follow the movement of the diaphragm in and up. Continue until you feel euphoric. Once you’ve gotten the hang of diaphragmatic breathing in a supine position, try it sitting and standing. The more aware you become of the sensation of deep, vital breaths, the easier it is to recognize when you move back into shallow, chest-centered breathing. Deep, diaphragmatic breathing is an absolutely ace relaxation tool to have in your arsenal. Try it the next time you feel unfocused, tired, irritated, disconnected or just want to get a little high, au natural. Kapalabhati and Breath of Fire, two similar and dynamic pranayamas that significantly increases the amount of oxygen in the blood and the brain. Stimulating and detoxifying, they can clear the head and sinuses and fire up the belly — perfect for alleviating springtime allergies and general sluggishness. While the terms Kapalabhati and Breath of Fire are often used interchangeably, they are slightly different. Breath of Fire is prescribed in Kundalini yoga on its own (eventually building up to a 31-minute practice) or as a jetpack to boost many kriyas. Kapalabhati translates to Skull Shining Breath and is practiced with the intention of clearing the cobwebs of the mind — imagine polishing a fogged-up window until you can see through it clearly. The main difference is in the length and nature of the inhale. In BOF they are the same length. In Kapalabhati the exhale is longer and the inhale is passive; essentially it happens on its own. Breath is rapid, rhythmic and continuous. Inhales and exhales are through the nose. For Kapalabhati, focus on the exhale; it should be forceful but not forced. The vacuum created by the exhale will naturally lead to an inhale; teachers often call this a passive inhale. In Breath of Fire, work toward producing inhales and exhales of equal length. This breath can be fast and rigorous but the body stays relaxed, especially the face. No wrinkles! As you become more accustomed to them, these pranayamas can be practiced for long periods of time; but start small, one to three minutes — this is powerful stuff. Find a comfortable sit with a long spine, head gently inclined toward your chest. Set your attention at your third eye, just between the brows, with eyes gently closed. Hands can rest on your knees, fingers in maha-chin mudra (index fingers under the thumbs); or, to turn up the volume a bit, arms extended in a wide V over your head, fingers tucked into your palm with your thumb stuck out like a cosmic hitchhiker. Take a regular inhale and exhale to begin. Then, inhale partway and begin breathing rapidly while engaging the belly, letting it move in with the exhale and out with the inhale. When you’re done, draw a deep breath in, retain the air in until it no longer feels comfortable, and then slowly release air through the nose. Sit quietly and observe the effects. Breath of Fire and Kapalabhati are incredibly potent practices for arriving in the present moment, a snap to attention. As noted above, these are powerful practices, so begin with short sessions and rest if you feel dizzy or lightheaded. Neither of these pranayamas are recommended for pregnant ladies and they’re uncomfortable to practice on a full stomach. As with any pranayama practice it’s wise to study with a teacher. Energy moves up and out in unexpected ways, so a safe container for experimentation is really vital. Practice them on their own, as part of your meditation, or add to an asana like plank or utkatasana to heat things up. Modern medicine is just catching up to the ancient yogis on a variety of subjects, including quantifying the incredible healing benefits of breathing exercises or breath control – what’s called pranayama in Sanskrit. Science and research are now showing that intentional breathing balances the brain and reduces stress, anxiety, depression, and fatigue — all while boosting the mood, metabolism, relaxation, and inner peace. That’s a pretty great trade-off if you ask us! Research indicates breathing exercises also have an impact on chronic issues such as blood pressure, cardio vascular health and even fibromyalgia. The common phrase “Just breathe” takes on a whole new gravitas with these findings. Life in the 21st century is fast-paced, with endless distractions, plus we spend most of our days working indoors. The body’s natural healing rhythms are affected by modern-day lifestyles, including the breath. Shallow breathing has become the norm. The effects of shallow breathing are less than ideal, including fatigue, stress, anxiety, depression and illness. On the flip side, consider how you breathe when you take a walk in nature. The breath naturally deepens, filling the body with oxygen, leaving you feeling relaxed and energized. Our conclusion? An abundance of oxygen may be the easiest and biggest boost to your health and wellness regime. Best of all, it is so simple and we already have all the tools! We can restore and enhance our natural breathing patterns by bringing attention to the breath throughout the day and including pranayama in our yoga practice. Easy Breezy! It’s the same cycle every year, and changing recipes to “low fat” versions of everything is just as ridiculous as trying to play hermit and hideout fasting until the whirlwind is over. Worse yet would be to become glutionous in the moment, only to wallow in guilt and remorse later. Do you want to feel youthful, agile & alive regardless of your age? The eightfold path of yoga keeps the body and mind agile, peaceful & responsive. We all know yogis who seem ageless, appearing far younger than their actual years. That said, aging gracefully through yoga is not about looking young forever. 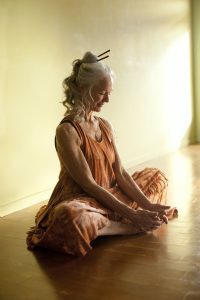 Aging gracefully through yoga begins wherever we find ourselves in life, whether we are still young or start practicing because our great-grandkids are into yoga. It is about cultivating deep self-acceptance and capacity to love what we’ve got. And aging gracefully is about giving ourselves enough support so we can lengthen, relax, let go, and breathe deeply during practice, rather than push ourselves to achieve something that we think we should be able to do. As each year passes, I enjoy the mind-blowing variety of yoga practices available. Rather than push myself to be strong and overcome fatigue as I did in my younger years, I am learning to support myself and deepen my practice with gentle & therapeutic yoga. I continually find that my students who are older and wiser are very mindful and clear about how deep they want to go. They ask for adaptations for knees, wrists, hips, shoulders or back injuries or discover adaptations themselves. Gathering all of the props to support themselves, they enjoy finding ways to let go and relax. They love breathing and moving and, given the opportunity to add some humor, laughter is quick and from the gut. When they have breakthroughs or openings, they discover ecstasy, lighting up like a small child. I will never forget the time, a man nearing his nineties joined class. He relaxed into yoga therapeutics with grace and then also wanted to explore some of the warrior series and tree pose. He balanced on one foot with determination and, yes, grace. Yoga is for every body. And the beauty and grace that can accompany a yoga practice comes from deep within ourselves. His practice was truly his own without ego and without judgement. When we begin to cultivate a non-judgmental mind and become willing to explore ourselves as we are in this moment, we are given an incredible amount of information from our bodies. We begin to tap into our body wisdom. Sometimes we discover that we are stronger than we thought we were. Other times, everything feels stuck and hard. Each time we lean into the hard places without self-criticism or going numb, we discover a little more light and grace. Often, this occurs as we find ways to provide enough support so our bodies and mind can relax. If we provide enough support, eventually something is going to let go. The beauty of allowing yoga to help us to age gracefully is that everything we do permeates out into the rest of our lives. If we are able to show up to our mats and be with ourselves in a way that is non-judgmental, loving and compassionate, we deepen our capacity to show up to the rest of life with these same graceful qualities. The powerful part of starting or continuing to practice yoga when we are not so young anymore is we are often already tapped into the many dimensions of ourselves. We can access and experience the subtleties of yoga. We know ourselves better and have more tools to talk ourselves through the confusing or challenging parts of yoga. No longer wanting to push ourselves so hard and incur injury, we tend to know our boundaries and treat ourselves with gentleness and wisdom. Just as Leonard Cohen said, “Ring the bells that still can ring. Forget your perfect offering. There is a crack, a crack in everything. That’s how the light gets in.” Aging gracefully through yoga comes as light gets into broken and stuck parts and we experience a profound acceptance of ourselves as we are. When we have these moments of yoga, we are ageless and infinitely graceful. Depending on where you are at in life, different asana practices can support your body and soul. Having a series of postures or flow that you can practice every day can help you to see how certain postures affect your well-being. Some people enjoy the Ashtanga yoga practice because there is a series that they show up to every day. Others prefer restorative postures, or seated meditation without any postures at all. Do you want support in designing a sequence that is perfect for your body? I highly recommend working with a private instructor who can teach you a sequence that will support you wherever you are at. The cold and flu season approaches each year as leaves blanket the ground creating an artful display of fall colors. Hearty root crops and winter squash are abundant at the farmer’s market. According to Ayurvedic wisdom, autumn is the vata season, known for its cool, light, dry, moving, and erratic qualities. There is incredible momentum, movement, and vitality that occurs with when the wild vata winds blow, generating transformation. And yet, we can also find ourselves forced to stop in our tracks as colds and the flu spread through schools and workplaces like wildfire during this time of year. To go forth with steady confidence and healthy bodies, favor a vata pacifying lifestyle which boosts the immune system and brings the body, mind, and spirit into balance. Check out these four tips to be well and stay calm. Incorporate a vata pacifying diet this fall and winter, which consists of foods that are warm, moist, smooth, and nourishing. Fresh, cooling crudites were perfect for the hot summer, but the crisp fall air invites forth a natural desire to nourish ourselves with warming butternut squash soups, more protein, and hearty stews. If you are already in the practice of eating fresh, seasonal foods and shopping at the farmer’s market, you may notice the natural shift toward heartier produce that balances the vata dosha. A self-massage with warming sesame oil may provide the moisturizing nourishment your skin needs to maintain its healthy glow this fall and winter. Plus self-massage boosts the immune system, improves circulation, and activates the parasympathetic nervous system, calming the body and mind. Follow the sesame-oil massage with a relaxing bath or shower. I begin every class inviting people to notice their breath. Many teachers do this as well, but because I work with students who have stress, anxiety, PTSD, and depression, among other things, the breath, and how it affects our emotional well being is one of the essential components that I always invite people come back to. I also want to give students an opportunity to notice how their body feels when they are completely at ease, which is what I attempt to establish in the beginning of class when we do grounding and breath work, so that they can pay attention to sensations that invoke a sense of peacefulness, to use as a sensation baseline, as this is something tangible that can be a take away when they leave class. Getting people to relax and ground themselves can take a while and there have been times where we start the class with a full 15 minutes of just breath work. What’s tricky about any type of breath work, is the fact that the breath can actually be anxiety provoking for certain people depending on their life experience, especially as we begin to move it around the body where we may change the direction of, or limit breath flow. For example, during a twist, the breath becomes limited as we reduce the amount of space that the breath can flow into. Therefore, it’s important to notice with each movement how the body responds not just from the movement, but also noticing subtle sensations and emotional responses as it concerns our breathing as well. Since many people have extreme difficulty with focusing on the breath all together, noticing these subtle changes are often missed. What I recommend to students, is to commit to noticing the breath as much as possible, not just during yoga class, but also throughout the day. If someone’s mind is extremely busy, then I invite them to lengthen the inhale or exhale which gives the mind something to do and notice. I suggest for students to notice how the breath changes as you experience your day (this can be something reflected upon at the end of the day as well where people can recall the incidents of their day, and recall how there body felt at that time, because as you remember something it is likely you will be able to feel the physical and emotional reaction just by thinking about it). If we develop a pattern of noticing the breath, we can become more aware of those subtle changes as we move about our day and this will allow us to shift our breathing to a pattern that serves us and helps the body relax. Then over time, those sensations and that baseline we create in class can invoke a sense of peacefulness that becomes the new normal, which is extremely empowering. We are always capable of more than we think we are. We think we know a lot but we do this to protect ourselves from feeling so little control over all the things we don’t know. Living by a set of ethical guidelines reduces suffering exponentially. When relating with others, especially during challenging times, it’s effective to imagine what it’s like to be that person (accompanied by the understanding that we’ll never really know what it’s like to be someone else). Mick Jagger was right. You can’t always get what you want but you get what you need. It’s easy to get lost in thinking about things that don’t matter very much. Making the world a better place is a game worth playing while we are here. To bring your full attention to life, get yourself uncomfortable. In the end no one much cares what you really do. You are the one that has to live with your choices. Parenting is the high stakes challenge of constantly being present, over and over and over again. Linking the movement of the body with the mind and the breath creates clarity and calm. Special people come into our lives that are catalysts in our growth. When someone comes along and rocks our world, this is a great gift. Pay attention and remain open. Memory is selective. Our relationship with the past is a story we tell ourselves based on beliefs we have about life and who we think we are. The most powerful and transforming moments in life are often those that come unplanned. Courage is required to resist the temptation to control things. We have a temper and mastery in the ability to not lose it. There are people who come into our lives to test our progress. Doing something that tests what you believe you are capable of on a regular basis is a good idea. Being open to the adventure makes the ride a great deal more exciting. Trying to change someone else won’t work. The mind is mostly a rabid hamster that repeats thoughts that originated from stories from the past and then forgets that that is what it’s doing. Time practicing being present every day is essential to remembering that we are largely, not our thoughts. Pay attention to how you breathe and you will learn more about how you feel. Forgiveness is necessary, especially of our parents. “Question Authority” and “Defy Authority” are not the same thing. The most valuable things in life are those things that we can’t see. Like peace. And love. You will feel happier and healthier when you do things that make other people happy often. Roll with it. There is an opportunity in everything. Belief is highly over rated. Find out for yourself. “Trust your gut” and “listen to your heart” are overused but useful phrases. Our body knows. The definition of beauty should evolve as we get older in order to reduce suffering. Although generally letting go is often not very fun, there is great power in it. We are each a tiny eco-system. We are stewards of our own health and happiness and we each must learn about the mental, physical, and emotional climate we each need to thrive. Think, speak and act as though your mother or God were watching. One’s “truth” is best delivered with compassion. Giving yourself fully to everything you do makes you feel good. Remembering on a very regular basis that we are going to die keeps our priorities straight. The gifts that we were given were meant to be given away.